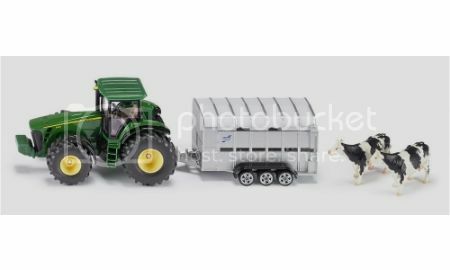 This is a great play set with John Deere model to compliment the popular SIKU 1:50 scale agricultural series: the powerful John Deere 8430 tractor pulls the three-axle Ifor-Williams livestock trailer into the programme of popular and great value 1:50 Farmer series models. The cows supplied with the set can be loaded onto the trailer for realistic play scenarios. The rear ramp also opens and can be secured with a cattle gate. If required, the roof of the livestock can also be removed to position the cows. The same applies for the cab of the John Deere. The 1:50 scale Farmer series has gained another typical agricultural tractor! The entire set is eye-catching due to high-precision detail and John Deere colours are kept to.